I know for the few people who do read my blog my last post might have been a little confusing. I am as vague as possible here when I talk about my husband's job. I am sure most of you can understand the security risks involved and have heard of something called OPSEC. If not you can read more about that by clicking here. Most of what I write of course has meaning for me but might sound like gibberish to everyone else. I did have one email and one comment about what an IA is because of a statement I made in my last post. So for the record and for those who are interested but don't know here is a little basic information. "A sailors deployed to Iraq is referred to by the Navy as an IA -- or Individual Augmentee. The Navy and Air Force have been tasked to "augment" the Army and Marine Corp in its efforts in the Global War on Terrorism. As such sailors and airmen are sent on TAD orders, serving as soldiers, to Iraq, Afghanistan, GITMO and Djibouti. Sailors receive two weeks basic combat training at Fort Jackson, SC before being deployed. These orders have been for six months to 490 days (15 months)." The second thing is the term 'Ombudsman" which I believe is similar to the key volunteer program for the Marines. I am sure the Army has their own similar program but I am not familiar with the term they use. Here is the basic description of an ombudsman. "The ombudsman program was established by ADM Zumwalt in 1970, in recognition of the challenges confronting Navy families. In one of his well-known "Z-grams," the admiral outlined a program -- the first of its kind in the U.S. military -- that provides better, faster communication between Navy families and Navy commands. The ombudsman is the official representative of the commanding officer and serves as liaison between families and the command." I would first like to say that all those in CA touched by the fires are in my thoughts and prayers! I have family there but they are not close to any of the areas. This week has been overwhelming to say the least. Being an ombudsman and having to give families news that they don't want to hear is the less glamorous side of the job. Oh wait there is no glamorous side is there? Well it just isn't any fun and it does win you any popularity. Ever hear the saying 'don't shoot the messenger"? I miss my spouse, my best friend, my lover and the person who tells me "it is all going to be OK" when it seems like it never will. And... so does every other military spouse in the world. No matter where we come from or where we are going (because we are always coming and going) it is the one thread that ties us all together. No matter the branch, rate/rank, first deployment or fifteenth deployment, newlywed or 20 years...you simply miss the one you love. Of course we smile when we want to cry, take care of our homes when we want to sleep in, hug our children when we need one our self (of the canine sort in my case), work when we feel like quitting and pay our bills but still we miss them. I won't debate that there are families out there that deal with much more that I could even imagine. My husband is not an IA and I would never compare myself (as I have hear others do) to "being in the same situation" or "at least they have phone calls and email". I am not foolish enough to think it is the same. I am not foolish enough to think it is even close to being the same. I know IA spouses and I know what life for them is like. We haven't spoken to them or hear from them in months but still it isn't the same. What is the same...I miss him. No really I am lame. I have been working on a painting that I am painting for my best friend Cindy. It started out as a birthday gift for her and it still is a birthday gift...sort of. It is coming out great however, it is taking forever. I am almost ashamed to say it but her birthday was on the 12th of this month. Today is the 20th and well yeah it is about half done. So yeah I am lame! Lucky for me (well not really lucky because I miss her) she lives on the East Coast. So she isn't able to easily show up to physically hurt me for being over two weeks late with her gift. She knows I am working on but I mean really! So it is my goal to have done by next weekend. I guess writing that here make it more like a real promise to myself and hopefully one I can keep. Powerless...yes that would be me! For the last 24 hours in the dark. This is the season of stormy weather here in Washington and unfortunately it has decided to start off with a bang this year. The last 72 hours have been windy, rainy and cold. The backyard looks like a good old East Coast hurricane came through it. Speaking of the East Coast...I heard thunder today that is good old East Coast thunder for the very first time since we moved to Washington. The boys and I basically camped out in the bedroom with the oil lamp (that I bought since the last time we spent three days without power) books, the police scanner and hot chocolate made with the luke warm water from the sink. Can someone please tell me why the only time there are weather issues (hurricanes on the East Coast and Snow or power outages on the West Coast) are when Dan is DEPLOYED??? I am thankful that all the trees in the backyard decided to stay rooted. I admit I was worried there for a while. Since the power was out it was quiet (yeah that creepy quiet) and all I could hear were the trees bending and twisting in torment from the "upta" 60 mph winds. The fence is another story though! There is one section that isn't looking all that great but it hasn't actually fallen over yet either. Hope it hangs in at least until Dan get home or David (his brother) get here from the East Coast. Well Bentley has his appointment today and I was able to discuss my concern with the vet. He basically told me that if he ever felt there was a problem he would refer me out to someone else. He can preform the test in his office however, there are several different eye conditions that can all present the same symptoms. Also, test ok for one things doesn't mean there isn't another problem. So there isn't really away to know for sure based on one test if there is an issue with the eyes. I can see where he is coming from and well it all made sense. Medically dogs aren't really all that different. B has a clean bill of health and in the doc's words "he is the perfect dog"! Clearly, the vet has no idea about his real personality as seen here! It seems like the more I get done the more there is to do. I have been working non stop pouring candles and the orders keep coming. I know for a small business owner that is wonderful but it can get to the point of being overwhelming. I am on the verge of needing to hire help but not quite there yet. Just kind of teetering on the edge...ever been there? I just keep telling myself I can do it all but I only half believe I am telling the truth. So needless to say it is times like this when I really miss my husband and could use those words of encouragement that he is always so willing to give. Trust me I have tried giving myself the "ataboy" but it just isn't quite the same. When is "enough" really enough? I actually never knew that dogs can suffer from glaucoma. This came as news to me when I learned that one of the families in our Command has a little JR that is currently suffering with this. I say suffering and I mean it literally. They have had to remove one eye and perform surgery on the other. Hearing the story and ordeal that this little dog has gone through it made me think about something. Just where should a reasonable pet owner draw the line? I mean I am the first to say that my pets are my "children' and as any mother there is nothing I wouldn't do to ensure they are happy, healthy, free of pain and out of danger. Even with that in mind I can't help but think of the things people will do and the extremes we are willing to go to to keep them around. I guess I just wonder if they would consent given the opportunity. With that being said I took two of my boys Winnie and Amos both to the vet yesterday for nail clips or as we refer to them around it mani/pedi day! So while their I ask about the whole glaucoma deal and learned that there is actually a test they can perform in high risk dogs or in my case at the owners request. I was asking because Tuesday Bentley goes in for his annual exam. I wanted to know if this was something that is recommend after a certain age or what might prompt someone to want to have this test done. What that is other than hearing a story and freaking out (like I tend to do) because you "think" your pet might have a problem. They were nice enough to answer my questions and add a note to my file that I would like to discuss this more with the Vet on Tuesday. So more to come on this! 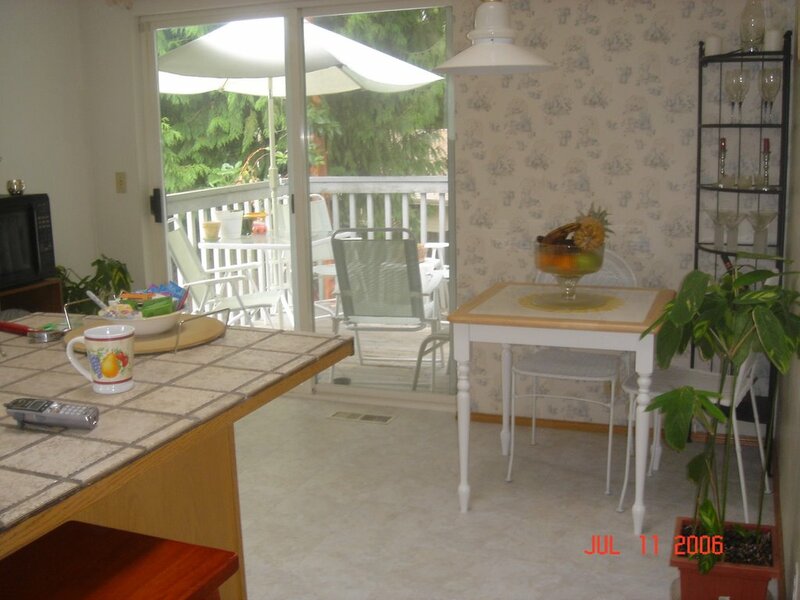 Wow I was looking through some old blog posts and came across an VERY old picture of the kitchen. This was when we first replaced the floor. I hated the wallpaper (it was hear when we bought the house) and on one of D's deployment I finally decided it was time to put it to rest. I am just not a fan of wallpaper and when I was trying to remove it I remembered just why that is! Since then we have painted and all I can say is WOW. This was pretty drastic but we actually love it. I wasn't so sure about this color eve though I was the one who picked it but it turned out great. Today seemed rather long. I guess maybe because I spent a lot of time thinking about all the things I need to get done rather that doing them. D has been gone just a few days short of 12 weeks today! It is starting to seem like forever but then I stop and remind myself that it could be far worse. think I just got so use to him being home that it seems harder than it has been in the past. I do know that I am not the only one who feels that way. There are several ladies who have been doing this much longer that feel the same way. The BBU order is coming along good and I am basically waiting on the labels from them. Once those arrive I have a plan! A plan that doesn't involve me sticking them on until my fingers bleed that is. I found a way to get some fast short term help that won't cost that much. So that is the plan. Once the first half is shipped I will be halfway there. Well it has been a while to say the least. I have a lot to catch up on or maybe I'll just start over. The boys are fine and I am fine but we do miss D! He has been deployed for a few months now and I simply miss him. It has been a long summer without him hear and now that winter has arrived it isn't any better! The days are getting so cold and short with nights so long. I guess the weather change is a good thing though since it means time is moving forward and soon he will be home. Cindy came to visit this summer and it was wonderful. I was great to have a friend around for a couple of weeks after spending so many alone. I missed her of course when she left but it was still great for her to be here. Except for the part where I cracked the LCD on my laptop. A great example of a not so good time. However, I am glad I listened to myself and not others. I found a perfect replacement on Ebay for a tiny bit of the price HP wanted to replace it.